INTERACTIONS: People possessed by Otora gitsune exhibit a few telltale signs.Firstly, they would experience an excess of discharge from their left eye. Their left leg would also begin to ache unexpectedly. They would also begin to talk endlessly about the Battle of Nagashino, that time they got shot, and other personal adventures that they never actually experienced. Victims possessed by Otora gitsune could usually be exorcised by priests, however there were times when his possession was exceptionally hard to get rid of. In those cases, victims were recommended to travel to the Yamazumi Shrine in present-day Hamamatsu City, Shizuoka Prefecture for an exorcism. This is because Yamazumi Shrine is famously dedicated to wolves. Many of the rituals performed there invoke the power of wolves in order to chase away sickness and evil spirits. Foxes are said to be terrified of dogs and wolves, and so an exorcism involving them would be particularly effective at curing kitsune tsuki. 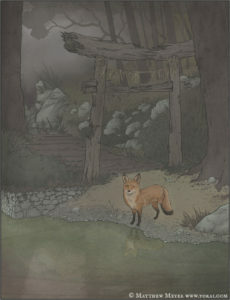 ORIGIN: Otora gitsune lived in the Inari shrine grove at Nagashino Castle. After the Battle of Nagashino, Nagashino Castle was burnt to the ground. Its Inari shrine was abandoned and never rebuit. 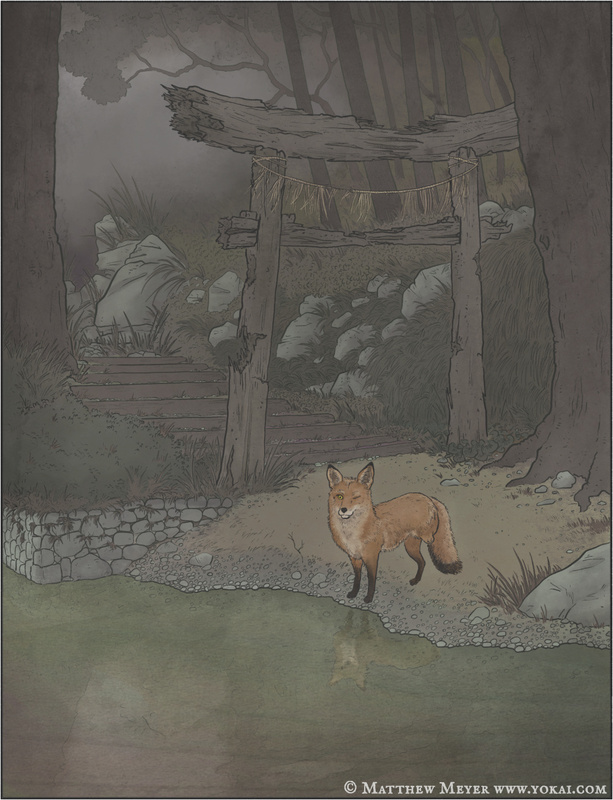 The kitsune who lived there became enraged and turned his vengeance against the locals by pranking them. His first target was the daughter of a wealthy family: a woman named Otora. It is from Otora that the kitsune got his name. From then Otora gitsune continued to possess villager after villager, causing mischief across the region. Otora gitsune became one-eyed as a result of the Battle of Nagashino. He was observing the battle from his grove when a stray bullet struck his left eye. There are a few stories about how he lost his left leg. Some say that he was eavesdropping on a meeting of generals deep in Nagashino Castle when his shadow was cast against the paper sliding door. The lord of the castle saw the shadow, and believing it to be a spy, slashed his sword and severed the kitsune’s leg. Another version says that one day he transformed into a crow, perched on a wall, and began cawing loudly. This annoyed a famous bowman who lived nearby, and the bowman shot an arrow at the crow, severing its leg. Otora gitsune was killed by a hunter while he was napping on the banks of the Sai River in Nagano Prefecture. However, his legacy was carried on by his progeny. After his death, his grandchildren took up the name Otora gitsune, and continued to possess people, telling their grandfather’s story through human mouths.